Aloha, back from paradise and will be posting some other tropical recipes (yes, I couldn’t help myself and cooked on holiday but just a little); however, this SE Asian dessert was too good to pass up. This is another amazing Thai dish that I never ate in when we were working in Chiang Mai which is good cuz I’d probably weigh 300 pounds if I had 😉 The owner of our favorite little Thai restaurant was beta-testing a recipe for a scrumptious coconut custard cooked in a kabocha squash through the usual nebulous conversations with an Asian Mom and home recipes, a pinch of this, use X, Y, or Q or whatever is in the pantry, it should have this consistency [plop. Plop! ], from her childhood memories. And while it tastes delicious: eggy coconut-y custard, check. Sweet, starchy kabocha, check. Gelled custard … um, a bit too liquidy. Needless to say, since she’s busy running a restaurant, this little gem isn’t gracing the menu cuz she hasn’t had time to work out the kinks so if I want to eat this ambrosial dessert, I need to make it at home. Perusing the interwebs, this dish is usually prepared in a steamer but like most people, I don’t have a steamer big enough to fit a small pumpkin but I can create a perfect water bath in my hardworking oven that will work just as well 🙂 I’ve modified a recipe from Saveur by changing out my fats, switching out cholesterol-ful egg yolks for whole eggs which have protein from the egg whites to allow the custard to set, increasing the coconut milk a bit to make up for the loss of egg yolk fat (you need a certain amount of fat otherwise your jiggly custard will be hard 😦 ), and substituting light brown sugar for palm sugar cuz brown sugar lives in my pantry and they have a similar level of sweetness. By using the top as a lid you can bake this at a higher temperature and cut the baking time in half. And in case you’re interested, it has the trifecta of eggy coconut-y custard, sweet starchy kabocha, and a jiggly custard with no ooze with the hardest part being hollowing out the kabocha. Easy and delicious? w00t! In fact, piggy dear hubby inhaled 3 pieces after dinner. Good thing he bikes to work. Oh, and if anything survives the midnight refrigerator raids, it tastes amazing the next day cold or at room temperature. 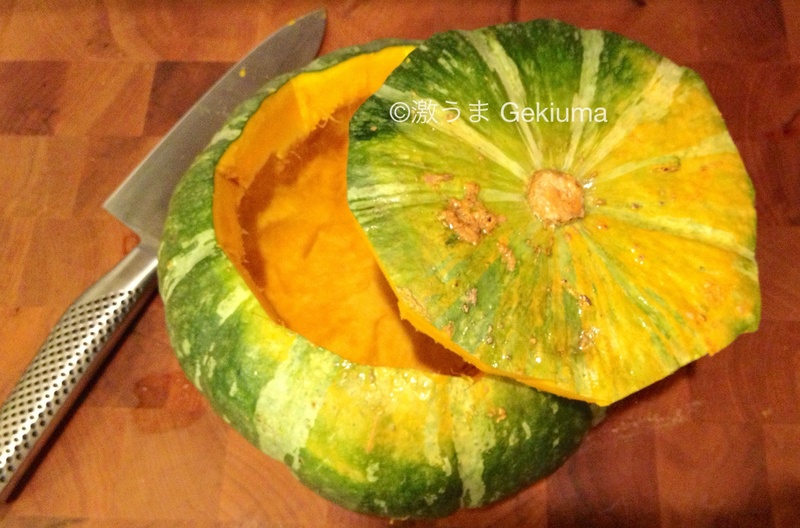 How to cut a pumpkin/kabocha squash without being nicknamed Stumpy? Cutting round wobbly things with a thick outer skin is always tricky. Make sure your pumpkin/squash is clean and dry so it doesn’t slip when you’re holding onto it and use a stable, flat cutting surface. I use my very sharp chef’s knife but you can also use a keyhole saw, the serrated teeth cut through the tough skin well and the slight flex allows you to make turns. Rinse and scrub kabocha skin then dry well. Cut an ~9-inch diameter hole around the stem of the squash. When cutting the top, try to angle your knife inward at a ~45 degree angle so the top can serve as a lid when baking. Use a spoon to scoop out the seeds and strings. Use the spoon to clear off any attached strings from the inside of the top. In a small ~1-2 quart pot combine coconut milk, brown sugar, and salt. Heat over medium heat till sugar and salt are dissolved ~2-3 minutes. Let cool 5 minutes. 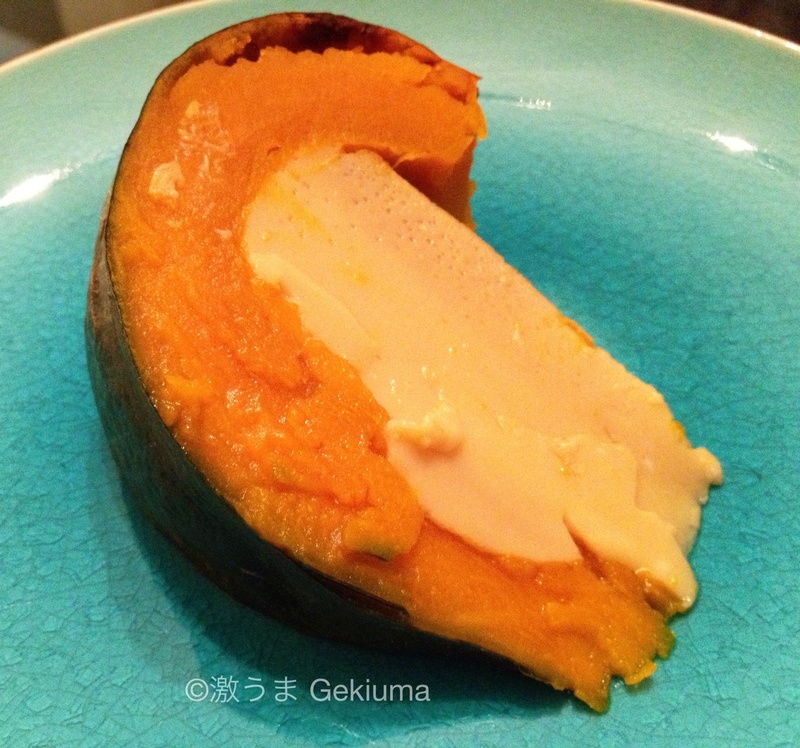 Stir in eggs then pour custard into kabocha squash and cover with squash lid. Place squash in a ~9 x 9-inch baking dish. Place baking dish in oven and using a watering can or pitcher, pour hot tap water into dish till dish is 1/2-2/3 full. Bake till a knife inserted into the custard comes out clean ~50-65 minutes. With a 14″ squash, clay baking dish, and convection it takes me 55 minutes. Let cool 10-5 minutes before cutting. Makes 8-10 servings. If you can carve a pumpkin you’re already halfway there. The “hardest” part about the cooking for me was how to lift the lid to check for doneness without gouging the custard. Next time I think I’ll make a handle out of a 2-inch wide strip of aluminum foil wrapped around the lid (like an equatorial line). oh my goodness this looks incredible, and i just found a place near by that sells these pumpkins! 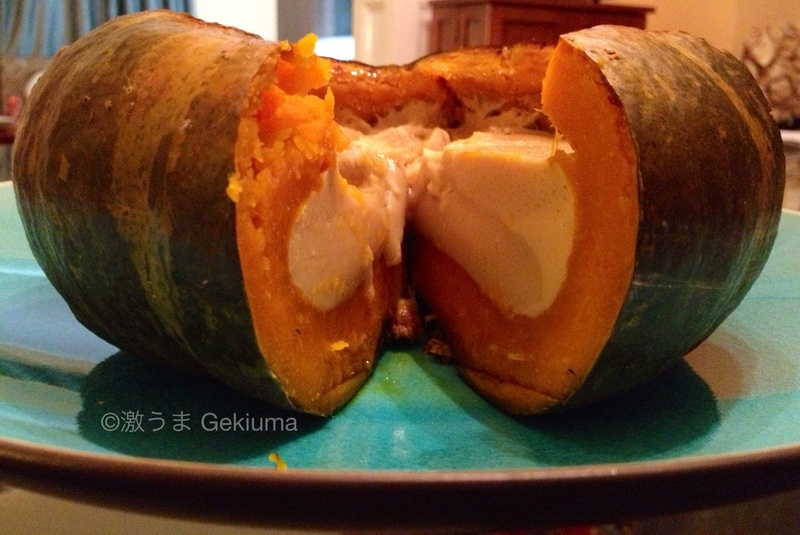 Ooo, you will be so happy with kabocha squash. I used to loooove butternut squash until I discovered kabocha which has an even smoother texture and a natural sweetness. I have sweet tooth and this is just perfect dessert to end a meal.